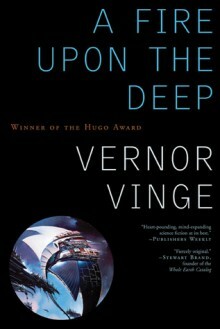 In 1992 Vernor Vinge amazed the science fiction world with this epic novel of star-spanning adventure. It won the Hugo Award for Best Novel, and has since become a landmark in the field. Now, with the long awaited sequel The Children of the Sky about to be published, we are proud to offer the first-ever trade paperback edition of this big-screen SF classic. A Fire Upon The Deep is the winner of the 1993 Hugo Award for Best Novel.